Independent Swiss watch brand HYT is incredibly young by watchmaking standards. The brand, founded in 2012, has nonetheless become a popular name among watch collectors looking for something different and unique. HYT watches do not use the customary hour and minute hands to indicate the time. Instead, they have a complex system of bellows and capillaries, through which a viscous fluid flows to indicate the time. 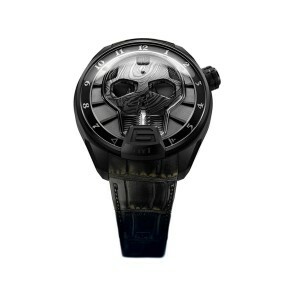 Taking their bold and daring designs a step further, the brand offers an entire collection of Skull watches, wherein a sculpted skull sits in the center of the dial and the liquid moves around the skull to indicate the hour. Each skull is a sculpted piece of metal, raised and, in some instances, engraved. To create the capillaries (or tubes) that wrap around the skull shape was no easy engineering feat. The skull shape of the glass tube, which is less than one millimeter in diameter, was the biggest challenge because it required sharp angles. 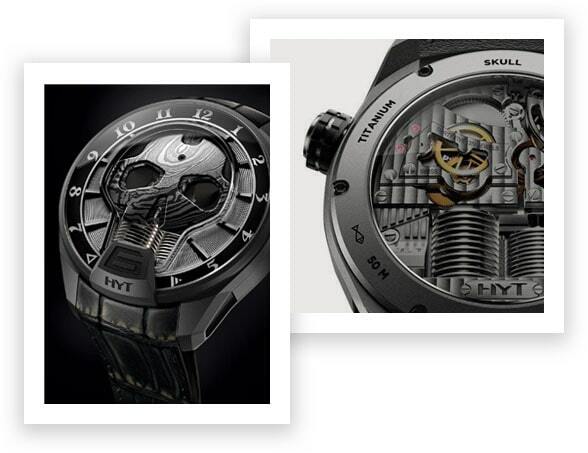 The brand’s engineering partners nevertheless conquered the task brilliantly and introduced the first Skull watches in 2015. Every tiny detail of the Skull watches is designed as a tribute to the concept of Memento mori: Life is short, seize the moment. 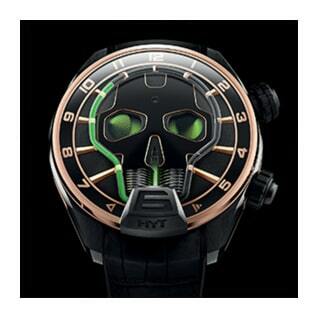 Today HYT has a comprehensive line of Skull watches that include a 48.8mm size, and a larger 51mm size. The brand has also devised a way to put color into the caliber in some of the watches, particularly the Skull Green Eye and Skull Red Eye watches, so that the eyes of the skeleton glow in the same color as the liquid used to indicate the hours. These watches feature a seconds dial in the left eye and a 65 hours of power reserve, indicated in the right eye. The Skull collection also includes a Skull BadBoy series, with a totally blackened case and a Damascus steel skull for the ultimate bad affect. In fact, for this blacked out timepiece, it took the brand more than a year to develop the opaque black liquid that not only has the right viscosity, but also is UV resistant. Each of the Skull watches is crafted from either 5N 18-karat rose gold or black DLC titanium, with brushed and micro-blasted finishes. The retrograde fluid that indicates the hour is typically complementary in color, and the watches are powered by a manual-wind caliber that is exclusive to HYT. Each Skull model is made in a limited-edition series, each with its distinguishing and unique feature; some have the hour markers on the bezel side, while others feature the hours on an outer chapter ring. Some skulls are engraved, some offer a patina and others are Damascus steel, or feature wood-like graining. Essentially, the concept behind the skull watch is to celebrate life and time, and HYT achieves this with texture, color, and bold appeal. Roberta Naas is a veteran watch and jewelry industry insider and influencer. A journalist with more than 30 years in the field, Naas pioneered as the first female watch writer in America. An award-winning writer, she travels the world to uncover stories, conduct interviews, and bring the newest watch and jewelry information to the forefront. She has authored six books on watches, writes for such esteemed publications as Forbes and Elite Traveler, and is the founder of www.ATimelyPerspective.com.